I must say, BBC is certainly keeping me entertained and engaged with their series. First I was blown away by the first season of Luther, starring the lovely and talented Idris Alba, then I was hit again with season one of Sherlock. BBC does big things in a small amount of time. Luther had only 6 episodes in it’s first season, and Sherlock had only three (at 90 minutes each). 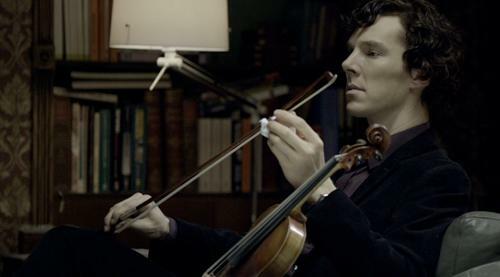 Even with the new approach to the character there is still the classic violin playing, the villainous Moriarty and the quirky detective skills. I did enjoy the modernity in the use of technology in the series. iPhones are a big part of the plot, and you won’t catch an episode without multiple text message conversations. Dr. Watson is also a blogger. The series also plays around with homosexuality a bit. After watching the whole season, at times I thought Sherlock Holmes was gay, or Watson was gay, or both. I definitely give the first season of Sherlock 5 stars. I’m anticipating the next one. I want to see the series now! @socialitedreams - the series is SO good! I'm sure it will come to BBC America soon over here. I downloaded the BBC version. The phrase was never actually said in the originals, films or books. It's kid of urban myth, like 'beam me up, Scotty' or 'play it again Sam'. @SelahBeth - someone else mentioned that to me, had no idea! I still want to here it, though. Since everyone says it. I have to check out this show.